In a steamer, bring some water to the boil. 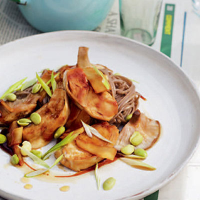 Put the chicken, mushrooms and ginger in the steamer, cover and cook over a medium heat for 18–20 minutes, until the chicken is cooked through. Meanwhile, pop the soya beans out of their skins. Scatter them, with the salad onions and bamboo shoots, over the chicken 3 minutes before the end of the cooking time. Remove from the steamer and stir through the oyster sauce. Serve with noodles dressed in sesame oil. The spicy peach fruit of the Cono Sur Viognier from Chile will stand up to the fresh ginger notes in the dish.